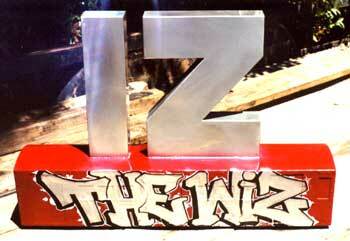 Comments...This piece was made for and given to the graffiti legend IZ the Wiz. I was inspired to make this piece because IZ in my opinion is one of the most under rated graffiti artisits of all time and doesn't get enough credit for all the work he put in when he was in his prime. For those of you who don't know this is the patented IZ throw up on top of a scaled down subway car. Credits...The "THE WIZ" piece on the side of the train was done by Renos HTK. Copyright © 2003 MetalManED.com All Rights Reserved.